Description: DARK MAGIC — After being marked by The Hollow’s dark magic, both Klaus (Joseph Morgan) and Marcel (Charles Michael Davis) experience the symptoms of a malevolent haunting, forcing the two adversaries on a violent collision course. Meanwhile, Hayley (Phoebe Tonkin) and Elijah (Daniel Gillies) head out to speak with Mary (guest star Debra Mooney) after Hayley uncovers a mysterious link between the dark magic and her former wolf pack. 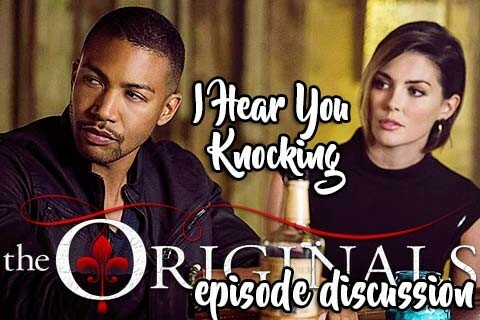 Finally, as an exhausted Freya (Riley Voelkel) risks her own life to cure Klaus’ infection, a guilt-ridden Keelin (guest star Christina Moses) must decide whether to honor her hypocratic oath and help Freya – or flee the Mikaelson’s forever. Boring episode was boring . Klaus - I did like his scenes with the ghosty ghoul/Mikael. Still didn't truly care though. Just meh. Elijah - Over dramatic as usual . His last scene with Marcel was just too ridiculous for words. Freya - I mean I get this season is only 13 episodes, but how do you go from keeping wolfie as a pet to suddenly wanting to be best buds and possibly bone her . Talk about rushed. Hayley - Glad she acknowledged she did "horrible things" to find her family only for them to be dead. Only wish she had actually voiced that she helped betray her hybrid friends and orchestrated a massacre...As for the blue ghosty being tied to her family I just don't care. I feel like 4 seasons into the show is a little late to actually be exploring her family history. Really should have been in s1 or s2 with Jackson and the wolves. But s4...nah dude. Marcel - Was there, don't care. Wolfie - Run you idiot! Vamp Lady - Shady mofo...color me shocked . Missed Vincent tbh. This was witch business and him not in the episode made no sense at all. Over all this episode was complete filler and little happened at all. Also a freaking thorn being the new weapon to kill an original is the dumbest thing ever . I can't muster up any enthusiasm for this season. Also a freaking thorn being the new weapon to kill an original is the dumbest thing ever . Exactly. Like WTF man that's just so stupid. At least make the weapon not be something so dumb. So just a scratch can now kill an Original?? I'd be pissed off if it wasn't so laughable. It's really just sad tbh. The most powerful creatures in the world could be brought down by a thorn . Exactly. Like love them or hate them, a killer twig is just unanimously stupid and total bs. I'm sorry to hear a lot of people aren't enjoying this season. I think it's been great. Except I'm with you on this episode--I did find it boring and a bit of a retread. Normally I really like the Klaus/Mikael stuff but I feel like they've already done enough of that. I liked seeing a flashback to their past, and Klaus thinking taking down a ghost is a peace of cake (and then seeing it isn't!) but that was about it. I think this is setup to Elijah actually being affected by the Hollow. That last speech to Marcel seemed a little too vindictive or something. He seemed to be going too far. Only wish she had actually voiced that she helped betray her hybrid friends and orchestrated a massacre...As for the blue ghosty being tied to her family I just don't care. I feel like 4 seasons into the show is a little late to actually be exploring her family history. Really should have been in s1 or s2 with Jackson and the wolves. But s4...nah dude. Did that happen in TVD? I remember not liking her in TO because of something that happened in TVD, but on TO it was completely glossed over. This I actually wasn't shocked b/c she was originally in town for Klaus's "trial" so I figured she might have nefarious motives. Why Marcel trusts her I don't know (guess he thinks he can handle her, but still.) I don't find her all that interesting so far, so I hope this improves. This is hilarious. Killer Twig gonna take down the originals. Truthisbeauty yes on TVD Hayley agreed to work with Professor Creeper in his pursuit to bring back Silas for information on her family. She became friends with Tyler and helped him and other hybrids break their sirebond to Klaus only to turn around and tell Klaus that they were planning to take him down which lead to the massacre in 4x09. She deliberately told Klaus because the massacre had to happen in order for Silas to come back so it wasn't as if she was just warning Klaus to save him. Then Professor Creeper gave her a flash drive on her family stating they were all from NOLA and dead. That was it. Ah, I thought so, thanks. That was during the season on TVD I started emotionally checking out. It really did come out of nowhere with her and Klaus. I wish they hadn't set up this series with their random hookup. They could have easily tied her into the drama with the family by maybe having her be a descendant of his father's pack instead or something. It was just weird.